Jen's dollyblog. 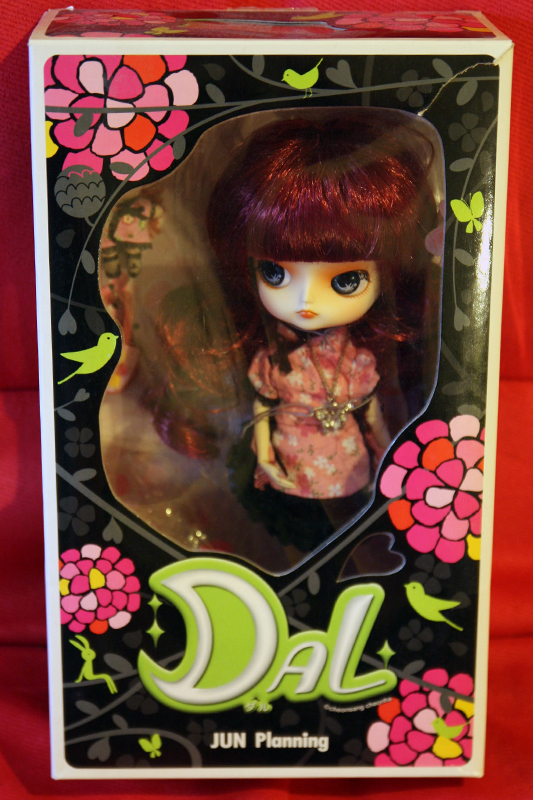 Talk about BJD's, Blythe's and other miscansellous dollthings, and my own creations. I know I've been non-existing for a long time, but with everything and LDoll closing in I've been trying to get at least something finished for it. 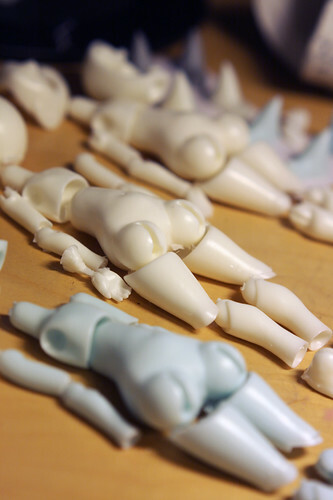 For this year I made a Lati-sized little dolly, and I'm trying to finish seven of them to be sold at Lyon. Good news is that this time, if there's interest I can make them after Ldoll as well :) I'll also be making a second face plate some time after Ldoll. I ordered some businesscards as well(finally!) and I've been thinking about renewing and clarifying my site and such... More about those later. But here are couple of previews I already took of what's in the making, I'll post more when things are starting to look finished. On other dollynews I bought and got an Anais head for my extra Volks body and can't wait to paint it sometime after all this! Also the new SG body is so nice, (I was at Tampere and picked up my Sweet Witch Agata from a GO while there) I really like it. I think the SW head is a tad small on it for my tastes, but I'm sure it'll be fine after face up, wig, horns & etc. But she'll have to wait too. 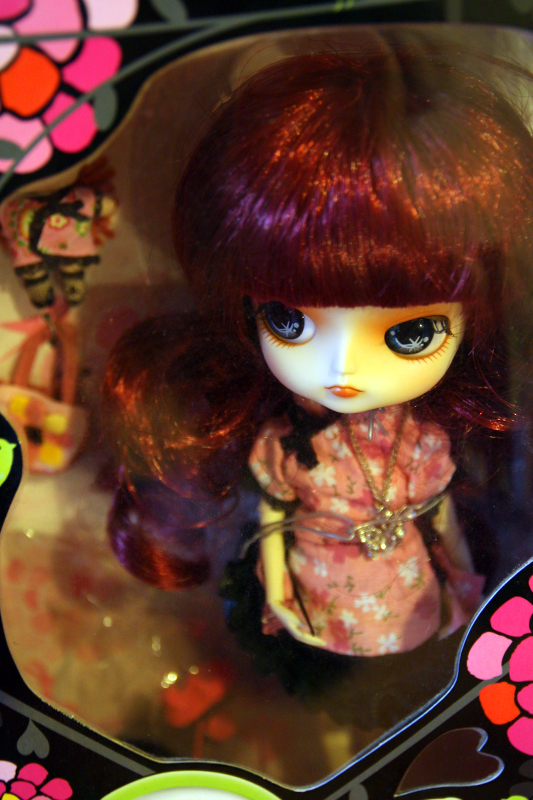 Other plans are, I really love the new Cericedolls Ninon, I've been waiting for one with a head I would really love. I just hope Lillycat won't make a preorder too soon because money. I was also supposed to buy a Lilin from a finn, but since she decided she can get more of it on DoA I figured I will actually try to get a fairyskin instead someday. That's all for now, I 'll try to get back being more active after all this craziness of LDoll workload. 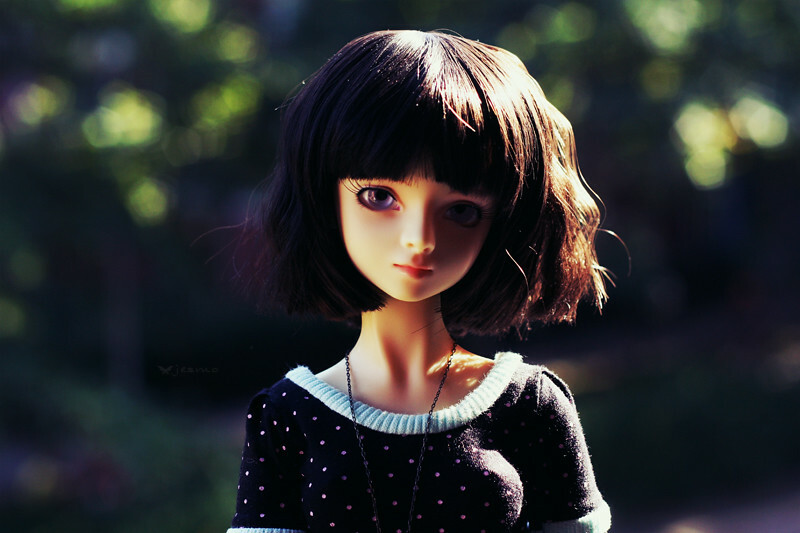 Though if someone follows my doll-tumblr all this was probably old news already. I have to admit I'm one of those who find micro-blogging somewhat easier, feeling that LJ for example requires some actual content(lol). I don't really know where else to start since I don't really move in the Pullip circles, so here we go. Pöydällä seisoo ryhmä erikokoisia ja -näköisiä yllättävän yksityiskohtaisia nukkeja, nuorten ja vähän vanhempienkin pyöriessä ympärillä. Otetaan kuvia ja ihastellaan vaatteita, hiuksia ja kasvoja. ABJD (tai tuttavallisemmin pelkkä BJD) on lyhenne sanoista Asian Balljointed Doll. Nukeilla on nimensä mukaisesti pallonivelet jotka mahdollistavat laajan skaalan realistisia asentoja, ja ne on valmistettu käsityönä polyuretaanimuovista. BJD-nukkeja valmistavia yrityksiä on nykyään jo lukuisia, mutta niille kaikille on yhteistä se että ne sijaitsevat Aasiassa. Harrastukseen mielivä joutuu siis useimmiten tilaamaan nukkensa ulkomailta; suoraan Aasiasta, tai Euroopassa sijaitsevan välittäjän kautta. Viime vuosina myös länsimaissa yksityiset taiteilijat ovat kasvavissa määrin innostuneet tekemään ja tuottamaan BJD-nukkeja. Nukkejen hinnat vaihtelevat koon ja julkaisumäärän mukaan suuresti, halvimmistakin saa kuitenkin varautua maksamaan 200-300€ ja kalleimmat voivat lähennellä jopa tuhatta euroa. Miksi tällä harrastuksella sitten on niin vankka ja koko ajan kasvava harrastajakunta? Yksinkertaisesti siksi että vaikka nukke itsessään on kallis, se on pitkäaikainen tuote, joka inspiroi harrastajiaan myös puuhaamaan paljon erilaisia asioita niiden kanssa. Monet innostuvat ompelemaan nukeille itse vaatteita ja tekemään koruja, nukkeja on antoisaa valokuvata, ja niillä voi kuvittaa tarinoita Kyse ei siis ole lasten ’nukkeleikistä’, vaan paljon moniulotteisemmasta harrastuksesta. Lisäksi ns. nukkeilu on vahvasti sosiaalinen harrastus. Harrastajat kohtaavat kotimaisella ja ulkomaalaisilla foorumeilla, vaihtavat ajatuksia ja neuvoja, esittävät ottamiaan valokuvia ja myyvät tekemiään tavaroita ja tuotteita. Foorumien lisäksi usein järjestetään miittejä eli tapaamisia, jonne kokoonnutaan tapaamaan muita harrastajia ja pitämään hauskaa porukalla. Miiteissä on mahdollista nähdä kauempanakin asuvia harrastajia ja erilaisia nukkejamalleja. Some photos I've posted elsewhere already but not here yet. As per request here's a little comparison with my grey dolls(minus Ace). I'm not sure the lighting is the best but I tried to use natural light. Narae is actually pretty much the same darkness with my Charlotte, just a colder tone. And just for reference's sake, with Volks pure skin, Soom cream white and Unoa fresh skin. 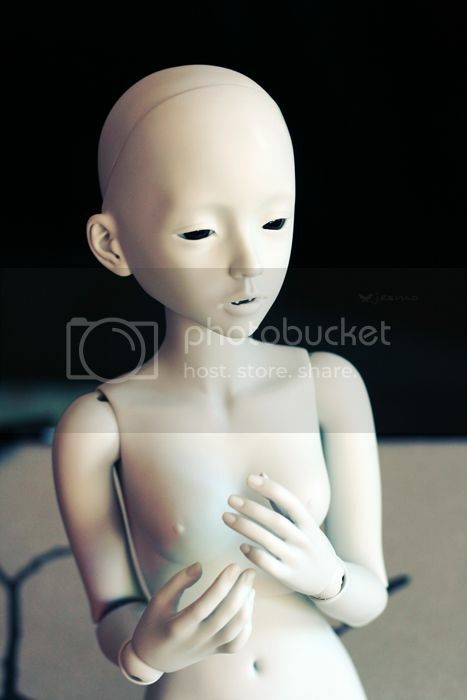 I received my grey Narae last week and only now realised she doesn't have the pretty old Narae hands. What ever happened to their hands??? I was really looking forward to the 'hand on the hip/pocket' hand D: Nuuuuuuuuuuuuuu.....! Oh yes, my Lünn arriver a while ago and I'm smitten. There are a lot of problems with her posing, the body is not the best when it comes to engineering, but it's soooo cute and I'm so happy I went with Lünn after all. (Though I'm sure have I gotten Khöl I'd be just as happy with her.) I gave her a quick face up an a side of a commission, and I'm trying to make some clothing for her as well. And she desperately needs a name, I have some ideas but nothing good yet. A while ago I realized half of my dolls have no names, oops. Have to fix that. And yes, I'm still trying to... well clean the lot isn't exactly fitting way to say it, but slowly going through the dolls. I finally gave in and put my Narin for sale ;~; It's SO pretty, but I just don't do anything with him. Better somewhere someone might actually play with it. I'd also need to do a lot of TLC on the ones I'm keeping for sure, Oumi needs the new body(I love her but that body is so uninspiring), Helle would need better strings and some serious sueding, a few dolls would need a new face up... Well all this will slowly happen :) I really need to take up sewing clothes for them again too. Not to mention I need to finish some masters so I can start casting for LDoll! Maybe someday I can stop feeling so guilty about everything I do and don't do and actually enjoy things and take photos again. On the other hand I'm afraid I've been feeling guilty about everything for so long it's become a sort of natural state of mind for me, and I won't be able to let go of it anymore.